The most spacious roof boxes featuring exciting design and smart functions. Patented Power-Grip quick mount system, for fast and secure fitting using one hand only. Aerodynamic design for great stability, reduced air resistance, wind noice and vibrations. Central safety locking system with grip-friendly key. Available in four sizes in stunning glossy silver. 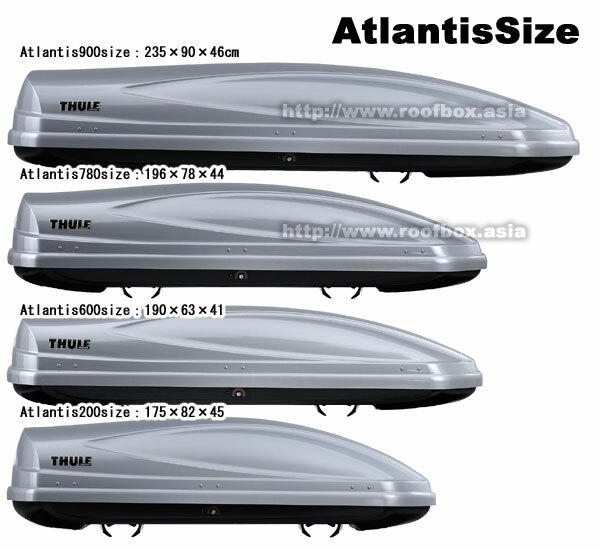 Atlantis 780 also available in black glossy. Unique, patented quick mounting system. The grip claws are tightened around the load bar as the knobs inside the box are turned. Self-centering over the load bar for top security and CityCrash tested for a maximum load of 75 kg. Fits load carrier bars up to 80 mm width. Standard on Thule Spirit and Atlantis. Longitudinal air channels and a spoiler on the box base minimize air resistance, wind noise and vibrations for best possible driving performance. Standard on Thule Spirit. Allows you to open the box from both sides, for easy mounting, loading and unloading. Standard on Thule Spirit, Atlantis and X1. Patented safety locking system ? the key can only be removed if all locking points are closed. Standard on all Thule boxes with side opening. A new grip-friendly key for better handling is standard on Thule Spirit and Atlantis.